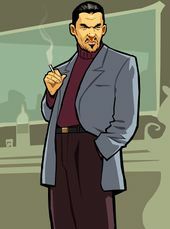 Zhou Ming is a character in Grand Theft Auto: Chinatown Wars and is the thirty-eight year old leader of the Ming Family, a sub-sect of the Triads in Liberty City. He has links to Hsin Jaoming and is suspected of masterminding several major counterfeiting operations in Liberty City and around the world. Along with Wu "Kenny" Lee and Chan Jaoming, he is a contender for the spot as Hsin Jaoming's successor. Both him and Chan were falsely accused of being the FIB informant who was ratting out the Triads (only for it to be revealed to be Kenny) and they were both killed by Huang Lee on Hsin's orders. He also owns a bar called the Ming Inn in Broker and an unnamed club in the East Island City district of Dukes. Uri - Killed for apparently betraying him. Affiliations: Linked to Hsin Jaoming's Liberty City Triad Organization. Suspected of masterminding several major counterfeiting operations in Liberty City and abroad. Zhou Ming drives a white Bobcat as seen in the missions Stealing the Show, Flatliner and Driven to Destruction. He drove a pink Hellenbach in the cutscene for the mission So Near, Yet Sonar. His name may be a play on the word "Zooming". His email address is ZM@myroomonline.net. His telephone number is 555-063-618. This page was last modified on 26 October 2013, at 17:15.